Remember the old days of using “witching sticks” to find hidden water? Modern dowsing techniques use infrared technology to detect water instead of non-scientific practices. 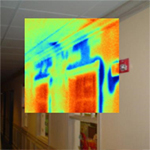 Thermal infrared imaging allows us to view heat maps and detect water leaks and seepage non-obtrusively. Using thermal infrared equipment is non-destructive and completely eliminates guesswork. By reviewing the thermal infrared images, we are able to pinpoint exactly where water is collecting behind walls, below concrete foundations, within masonry, and throughout the building. We do not need to tear into walls in search of water leaks that may or may not be there. By using thermal infrared technology, we are able to quickly find locations where water is present, thus saving time, money, and unnecessary destruction of property.